Sue Bradford pulled her bill as it wasn't garnering support at this time. I still see some merit in the proposal but acknowledge I'm in a small minority. Interestingly they are considering the same question in the UK. In the UK however it would appear there is considerably more support for change. The Populus parliamentary panel of MPs in July showed that, while Liberal Democrats were heavily in favour of reducing the voting age from 18 to 16, Labour MPs were narrowly (53 per cent) against, but Tory members were heavily (83 per cent) opposed. People who have difficulty reading and writing are to be issued with 'literacy cards' which they can present in dealings such as a bank transaction. Shouldn't these be called 'illiteracy' cards? Well, no, because the aim is to remove the stigma. The trouble is when stigmas are removed problems grow. The obvious example I would use is the stigma of illegitimacy. We banned the term in the 60s. Fair enough. It is no fault of the child if its parents weren't married. But I don't need to tell you what the results of de-stigmatising unmarried or even unpartnered procreation have been. On balance, not that hot. Stigmas can serve useful purposes. They steer people away from undesirable outcomes. They also help avoid clamours for government to legislate or ban every damned thing. Removing the stigma associated with not being able to read and write may seem like a caring and compassionate thing to aim for but will it really serve the individuals best interests? It looks like an acceptance of the failure of the education system. People arrive at primary school without knowing the alphabet but we say that's ok. They'll catch up. Then secondary school unable to spell but they'll catch up. Then at WINZ, where we put them through catch up courses. Then...still can't read and write....that's ok...here, have a card. It's not your fault. You are just differently-abled. Some people have particular difficulties eg dyslexia but I wouldn't mind betting that a good many have failed to learn because they come from families that put no value on education. They have multiple problems. I can see the merits in practice for the person being presented with the card ie the bank teller but in the larger scheme of things, regretfully, I think this is more bottom of the cliff stuff. Managing problems rather than trying to resolve them. Utopian socialistic experiments like the kibbutz movement, and countries that tried to create large-scale efficient socialism, all failed for the same reasons. They did not realize that while the zeal of pioneers, and the result of revolutions, could sustain a collectivist and other-serving mentality for a short while, these could not be maintained as the pioneers died off or became disillusioned, and as circumstances became less revolutionary. Basically, they ignored the evidence of history that self interest and family orientation is not the product of capitalism, but is human nature due to selection from evolutionary pressure over billions of years. And to follow on from that the Investor's Business Daily looks at why the combination of capitalism and socialism, the Third Way, isn't as successful as often touted; and how Europe lags badly behind the US economically. Mojo has an interesting post about the rate of bi-polar disorder in young Americans. I had a look at how many people were on benefits due to a diagnoses of bi-polar disorder. The increase from 1997 to 2005 for bipolar disorder is 183% compared to 112% for diabetes. I guess there are only so many things public health officials can get hysterical about. As the Prime Minister yesterday launched yet another anti-family violence initiative, more babies were being born into non-working homes. Every year thousands of babies are born on to new or existing benefits. Many of these babies will join the ranks of the most at-risk children in New Zealand. Last year Work and Income acknowledged that New Zealand has a very high rate of family violence and that many victims are beneficiaries. Hence service centres are an "excellent" place to identify victims. Instead of acting rationally and questioning to what extent easy access to benefits actually adds to violence by facilitating dysfunctional lifestyles, the best plan of action the government can offer is to develop ever more resources to fight the growing incidence. An honest appraisal of what role welfare has played in breaking down committed and independent families would be a far more valuable exercise than anything else proposed to date. There is a clear connection between welfare dependence and family violence. It is a vain hope that the second will diminish while the first is allowed to continue. This story has the wrong headline. It should have read, "Judge says benefit fraud very prevalent in New Zealand." This is just another case. The story is the prevalence of fraud. Prevalence but, I very much suspect, a growing indifference to it. Take David Benson Pope answering a PQ; The number of allegations of benefit fraud has fallen by over 36 percent in the last 6 years. The number of allegations received from either staff or members of the public in each of the last five years is: 29,363 (2001/2002) 29,628 (2002/2003) 27,134 (2003/2004) 13,462 (2004/2005) 18,845 (2005/2006) The number of allegations received for December 2006, January 2007 and February 2007 were 1,457; 1,597 and 1,410 respectively. The number of concluded prosecutions for the 2004/2005 and 2005/2006 financial years is 1,306 and 937 cases respectively. Note the huge drop of 50 percent between 2003/04 and 2004/05. There is no identical data to match but if I can compare breaches with allegations (substantiations would be even lower), in 2005/06 there were 18,845 allegations and 280,000 beneficiaries - a rate of 67.3 per 1,000. That's to be expected. People on benefits today are far more honest. Either that or the public and the department are far more tolerant. I can be a bit green sometimes but this somewhat surprised me. Having read a piece about the UK using lie detectors to uncover benefit fraud I thought I'd look a bit more closely at the story. In the process of searching lie detectors/ job seekers I came across this. I am dubious about even cutting and pasting from it. "Then the grand daddy of them all in 1976, Robert Muldoon’s National Superannuation, payable initially to couples at 80% of the average ordinary wage at 60. Historian Sir Keith Sinclair called it “the biggest election bribe” in our history." The DomPost has published private income figures from the Positive Ageing Report released on Friday. The Social Development Ministry survey found the average private income of a single person aged over 65 had dropped 88 per cent from $2200 a year in 1989 to just $260 in 2004. Why bother saving when the government is doing it for you? The following is from the UnitedFuture website. It refers to an editorial about extending Paid Parental Leave and the Families Commission. I have just seen the most sneering editorial in the Christchurch Press about this and the Families Commission generally. The Press has long been critical of the Families Commission, mainly through the vitriolic pen of its senior writer Martin van Beynen - a man I have never heard of as contributing anything worthwhile to anything - and I suspect he is the writer of this editorial (although since newspaper editors are so brave they have to cloak their opinions in anonymity you would never know). Christchurch readers of the Press might like to write to the editor and let him know what they think of his newpaper's bigotry on family issues. Martin van Beynen gave us (syndicated to the DomPost) a fabulous insight into New Zealand's 'poor' with a brilliant series penned as he toured NZ getting into places and homes Peter Dunne would shudder at. For that alone he earned my respect and admiration. He has most recently been up to the Northern Territories again covering almost unimaginable habitats and lifestyles of some Aboriginal people. Peter Dunne often surprises me with his grumpy opinions made publicly and without justification. How can the Press be 'bigoted' for opposing (in this instance) the remorseless extension of socialism and loss of individual freedom? I can only conclude Dunne has burnt so many bridges one more won't matter. To tell the truth, I am sick of hearing about work-life balance and the glories of diversity which are no doubt just peachy for those workplaces that can afford them. These workplaces, of course, tend to be in Wellington and usually entail spending our money on useless research, newsletters, conferences for the similarly minded and overseas trips. Workplaces like the EEO (part of the State Services Commission), for instance, or the Families Commission, or the Human Slights Commission, or the Office for Ethnic Affairs and all those organisations of a similar ilk that infest Wellington. The EEO's latest mind-blowing revelation contained in its latest newsletter is that good bosses tend to have more motivated employees. Or as the EEO puts it "discretionary effort and productivity can be increased by supporting work-life balance at all levels of the workplace". And (just for a laugh) you can always rely on a revelation from the Families Commission. The latest bombshell from this bastion of redundancy says the biggest issue for families about after-school childcare is cost and quality. Amazing. A man after my own heart. Well said. What is this government lackey angling for? Because he sure isn't doing the organisation that pays him to be CEO any favours. Remember this headline, Charities pay price of backing Bradford? One could just as well substitute Kiro for Bradford. 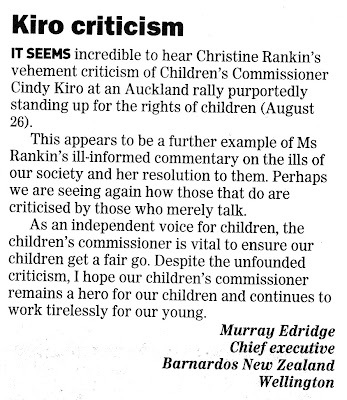 The Children's Commissioner role is highly politicised and Edridge's continuing support for her will come at a cost. Perhaps not to him though.